L.A.A., 10, was sexually abused by a grandfather in Guatemala; a gang tried to kill her mom for reporting it. But the child may never go before an immigration judge. Bullets were fired and a bomb was thrown at the Honduras home of 7-year-old A.M.C. Nine-year-old G.M.A. and her mother are Mormon and were threatened by “bad people” in Honduras. L.A.A., 10, was sexually abused by a grandfather in Guatemala and a gang tried to kill her mother for reporting it to police. The children never got to tell their stories to immigration judges or in most of the cases asylum officers, even though they are entitled to by law when they were separated from their parents at the border, attorneys suing the federal government state in court documents. Now reunited with the parents, the children may never get that chance if the administration goes ahead with plans to quickly deport the families, attorneys said in the lawsuit filed in federal court in Washington. Jose was reunited with his son. But the 3-year-old is learning to trust him again. The class-action lawsuit filed on behalf of six children who were forcibly separated from their parents as a result of President Donald Trump's "zero-tolerance" policy seeks to stop the deportation of all children who were taken from their parents and guardians so the adults could be prosecuted on charges of illegally crossing the border. The lawsuit piggybacks and expands on an American Civil Liberties Union lawsuit in California that led federal district Judge Dana Sabraw to force the Trump administration to stop separating families and reunite children with their parents. In that lawsuit, the ACLU is trying to persuade the judge to block the administration from deporting reunited families for at least seven days. The ACLU wants families to have time to consult with legal counsel because many agreed to deportation, believing it was the only way to see their children again and others did not understand paperwork they were made to sign. In the Washington lawsuit filed, on July 27, attorneys argue that children who were separated are entitled by law to “credible fear” interviews before an asylum officer to determine the validity of their claims that they fear persecution, harm or death if returned to their countries. The attorneys say the children, by law, have an independent right to seek asylum and a right to be accompanied by their parents while they are in those proceedings. Further, their parents have no right to waive their children’s right to seek asylum, the attorneys said in court documents. They came seeking asylum. Now they want their children back. “Everyone has been following closely the litigation over reunification and trying to make sure parents and children unlawfully separated are put back together,” said Justin Bernick, an attorney with Hogan Lovells who is representing the formerly separated children. "This deals with what happens after they reunify," Bernick said. "Right now the government is taking the position that children who reunify with parents should be deported and removed to their home countries and never given the opportunity to seek asylum." But "some may have viable asylum claims, and the government is not allowing them to seek asylum interviews or hearings," he said, adding that the lawsuit aims to make sure the children have access to the full asylum process. In a response to the lawsuit, the federal government has argued that the suit overlaps with the ACLU's case and should be sent to the California court, as were two other similar lawsuits filed in New York. An Immigration and Customs Enforcement spokeswoman said the agency was unable to further comment on the lawsuit's allegations that it has not responded to requests made to ICE officials. The suit also was filed against Department of Homeland Security Secretary Kirstjen Nielsen and Health and Human Services Secretary Alex Azar and the heads of ICE, Citizenship and Immigration Services, Customs and Border Protection, the Office of Refugee Resettlement and the director of the ICE San Antonio field office, Daniel Bible. 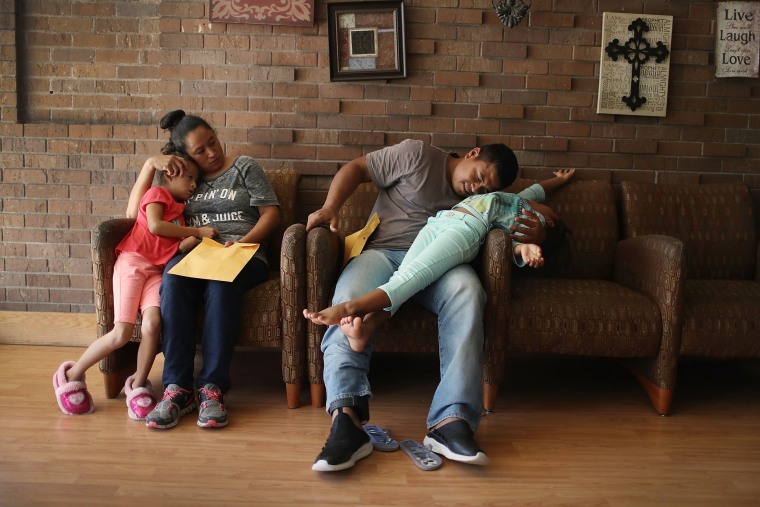 The Washington lawsuit includes tidbits of stories of six children, five from Honduras and one from Guatemala, that give an idea of the conditions the children and their parents fled and what they endured while in custody of the federal government. The suit tells the story of A.M.C, whose home was bombed and shot at in an attempt to kill his family; also, his father abuses him, according to the suit. A.M.C. and his mother were separated for 50 days and although A.M.C. has asked through an attorney to be allowed to explain why he is afraid to return to Honduras, he has not gotten a response to his request, the lawsuit says. The child identified as G.M.A. is afraid to return to Honduras because “bad people” harmed her mother because of their Mormon religion. They threatened to hurt her and her mother because they believed her mother reported them to police. G.M.A. was separated from her mother for 40 days. G.M.A was placed in a shelter in New York where she had a foster mother and foster siblings, who hit her, the lawsuit states. A cousin of the foster mother yelled at her and told her she’d never see her mother again. By the time they were reunited, G.M.A.’s mother had gone through her credible fear interview. The lawsuit states she was too distressed about separation from G.M.A. to fully participate and she wasn’t able to consult with G.M.A. for the interview and now is subject to deportation. G.M.A. has also asked to talk to an asylum officer but has yet to get a response, the suit states. A gang tried to kill L.A.A.’s mother after she complained to police that the girl was being sexually abused by her grandfather, according to the lawsuit. After L.A.A. and her mother were arrested at the border, an immigration official told L.A.A. she was going to be put up for adoption, the lawsuit said. They were separated for more than 35 days. This Obama-era program kept migrant families together. Trump ended it. L.A.A. 's mother had a credible fear interview and has been ordered deported. L.A.A. has had no response to her request to speak to an asylum officer and has not gotten a response. The lawsuit notes that the federal government classified the children as unaccompanied before they returned the children to their parents. Unaccompanied children are not subject to the same expedited removal proceedings as others who are arrested within 100 miles of the border. They are “entitled to all procedural safeguards of a full removal hearing,” the suit states. Also because some of the children were given Notices to Appear for a deportation hearing, the children are entitled to full immigration hearings before a judge and certain procedural protections, such as the right to be represented by counsel, the lawsuit states.